Argyle Feed Store has a number of hay bales that are great for completing a number of jobs on your farm, ranch, or garden this winter. 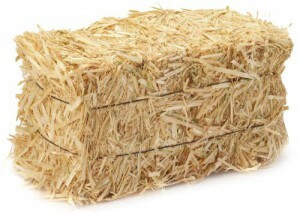 Straw is a great source of insulation and can be kept in animal stalls as bedding. This will help keep their stalls warm as well as giving them a comfortable place to rest in the cold weather. One trend that is on the rise is building straw bale houses, sheds, or barns. It is estimated that a well sealed straw bale house can save you up to 75% in energy costs! The insulation from the straw combined with an energy efficient design can be a huge source of savings for farmers and ranchers in the winter. Straw bales are also a great source of organic mulch for gardening in the winter, they mainly function as a cheaper alternative to raised beds. If you grow fall or winter vegetables, then straw bales gardening may be the secret to success this year. Don’t miss out on the great uses for straw on your farm, ranch, or garden this winter. Here at Argyle Feed Store, we are committed to making sure you find exactly what you are looking for. If you would like more information on the straw bales that we offer, then please click here to visit our contact page. We will be more than happy to answer any questions you may have.